You will probably not find mulberries at the grocers (maybe at the farmers market) because of their short shelf life. But, if you live in USDA zones 5-9, you can enjoy your very own mulberry tree harvest. The question is when to pick mulberries? This leads to a follow up question of how to pick mulberries? Read on to find the answers. Mulberry trees attain a height of between 20-30 feet. They make lovely, fast-growing landscape trees with the added bonus of producing delicious berries and leaves suitable for steeping as tea. The berries are really the stand out though. They look much like elongated blackberries and are sinfully sweet. 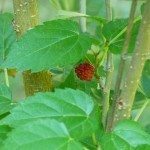 Starting a mulberry tree from seed can be difficult. The seed needs 90 days of cold, moist stratification and even then has a low germination rate. If you dislike failure, it might be advisable to purchase a young tree, especially if you want fruit quicker for harvesting. Mulberry trees like full sun in moist, slightly acidic soil (pH of about 6.0). They need to be planted deep enough to support their extensive root system. A little patience is required before you can begin harvesting the mulberry trees. It will take about three years before you can sample the fruits of your labor and mulberry harvesting can commence. 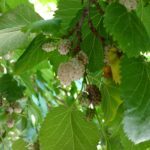 Mulberry harvesting season begins in mid-June through August. You will be looking for fruit that is large, black and sweet, so yes, a taste test is in order. If the fruit is ripe, then what? The time for harvesting the mulberry trees has arrived. There are two methods for picking the fruit. You can hand pick it, which depending upon your disposition can be tedious or relaxing, or you can use an old sheet or tarp to hasten the process. Spread the tarp under the mulberry tree and then shake the branches. Gather up all the fallen berries. Take care not to layer the berries too deep in the container or you will end up with a lot of crushed berries. If you can keep your hands off them, mulberries will keep in the refrigerator, unwashed in a covered container for several days. Or freeze the berries for later use. Wash them and gently pat them dry, then pack them in freezer bags. Frozen berries will store for several months.